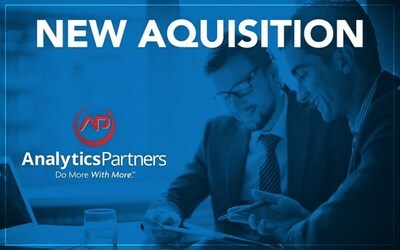 TAMPA, Fla., April 9, 2019 /PRNewswire/ — HealthAxis Group announced the acquisition of Analytics Partners based in Jacksonville, FL. The merging of business operations adds robust and proven analytics to complement the HealthAxis Group’s current and powerful core platform and services. HealthAxis Group acquired Analytics Partners stock and assets and will begin consolidating all business under the HealthAxis Group brand. HealthAxis Group is simultaneously the most experienced and modern SaaS-based supplier of benefit platform systems. Its vision is healthcare rebooted as a completely efficient, information-driven and cooperative institution. HealthAxis Group accomplishes this through a holistic approach enabled by software, services, and a driving desire to embrace the future. The comprehensive suite helps organizations address compliance, increase administrative efficiency, lower cost, and improve quality. Logic, workflow, and interfaces can be tailored to meet individual requirements. The fully scalable solutions include: benefits administration platforms, web portals, network and application management, consulting, BPO, transaction services, practice management solutions, electronic medical records, and technology services. Please visit www.healthaxis.com for more information about the company. Analytics Partners is a Jacksonville, FL based company that develops and implements Data Warehouse and Business Intelligence solutions. Leveraging over 500+ years of business intelligence experience, AP rapidly delivers industry-focused solutions and services from consulting and implementation, strategy and planning through end-user training and personalized support. Our products and services enable our clients to Do More with More; they are more informed, have more tools and are more successful.